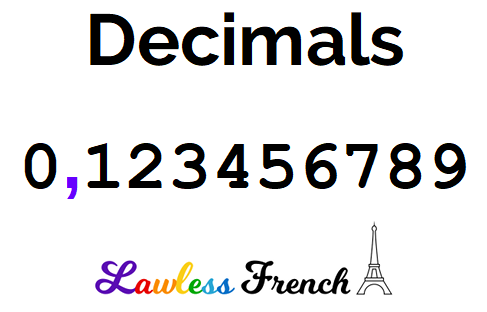 In order to learn to understand and pronounce French decimals, the most important thing to know is the symbol. In English, the decimal point is a period or full stop, which is called un point in French. But in French, the decimal symbol is a comma: une virgule. The sound files are MP3s and you can either listen to them online or save them to your computer for later. If you don’t know how to do this or can’t hear anything, please read help with sound files. Click “listen.” You can either listen and repeat the numbers or else practice writing them in French, in English, or as digits. After listening to the sound file for the random exercises, click “reveal” to check what you heard. You can listen as many times as you like. of Guillaume F. – merci !